Does Christmas just make you nuts? Looking to get a little squirrely for the holidays? Well, we would love to help you with that! 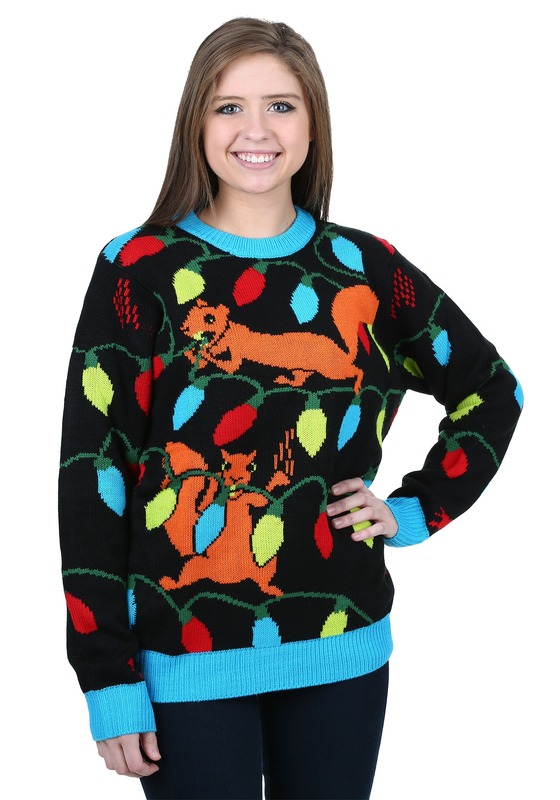 Take a look at this awesome Squirrely Christmas Lights Ugly Christmas Sweater. It’s the perfect thing to wear to add a little fun to the holidays or to blend in at any ugly sweater party. This goofy and colorful sweater depicts two troublesome squirrels chewing up the strands of Christmas lights that decorate this cozy pullover. Give everyone the gift of laughter this Christmas when you buy this hilarious ugly sweater for yourself. That’s a win-win if we’ve ever heard of one. So do yourself and everyone a favor by adding this nutty sweater to your wardrobe. Don’t stop there, though. Take a look a the rest of our funny ugly sweaters and start the ugliest collection of holiday sweaters anyone’s ever seen!